As I rose early one morning and glanced out the window at yet another beautiful Taylor-Made sunrise, I wondered if the day would be good to bake bread outside. The clouds are beginning to burn off. And a quick check of the forecast shows that the weatherman promises lots of sun and low wind. Of course in a solar oven you need the sun to bake bread, but wind can wreak havoc with the reflectors. I decided to go for it! You’ve just got to love those precious souls that wake up eager to greet the day. You know the ones – they spring out of bed with a smile on their lips and a song in their heart? Well unfortunately that’s not me. Oh I love mornings but I’m certainly in slow gear until I receive coffee-inspired motivation. So into the kitchen I shuffle, yawning and still half asleep – morning coffee still firmly gripped in my hand. Luckily I know myself well enough that I’ve started using several Bread-Making Shortcuts. I’ve already premixed the dry ingredients for my bread recipe and placed them in baggies in the freezer. I simply pull out one of the premixed bags of dry bread ingredients. Then I mix it with yeast, warm water, butter and an egg. Now I set it aside for the first rise, punch down and shaping. By the time the loaves are shaped I’ve set up the *solar oven and it’s ready to go. Since the winter sun here in North Texas is still pretty low in the southern sky, the oven is tilted pretty strongly to the south to channel the sun’s energy directly into the oven. The bread pans go into the oven to rise a second time. I keep the oven door ajar so it doesn’t get hot enough to actually bake the bread but offers a warm environment which will allow the bread to rise beautifully. When the second rise is complete I close and latch the oven door. Even though the temps today are a chilly 40 degrees, the temperature inside the oven rises quickly to over 300 degrees. I’m still pretty new to solar baking but I’m already in love with it. Our climate in the summer is stiflingly hot and humid and I hate to turn on the oven and pump even more heat into the house. Although I often make homemade bread I seldom do so in the summer months because of this. I’m anxious to try this solar oven for baking bread this summer. I also plan to use it quite heavily to dehydrate garden veggie excess from our garden. I’ll simply keep the door ajar so humidity can exit and the heat doesn’t get too high. Can’t wait to give it a try. Have any of you tried a solar oven? Do you have any advice to share? 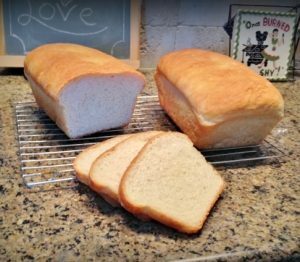 UPDATE: Previousl my bread recipe always seemed result in a pretty heavy and dense loaf, so I’ve changed to a KitchenAid Sandwich Bread recipe that delivers a light, fluffy loaf every time! 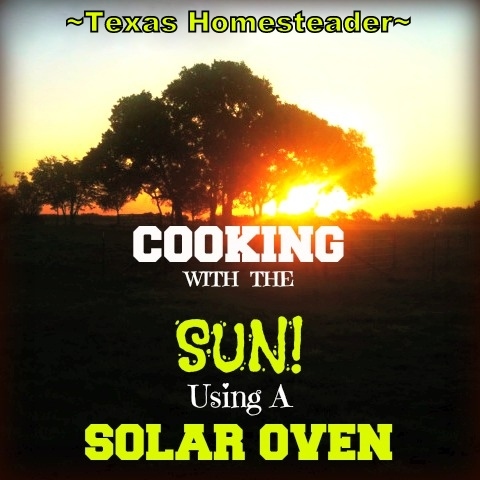 This entry was posted in Blog Posts and tagged Cooking, Environment, Frugality, Solar Cooking, weather on February 22, 2013 by Texas Homesteader. 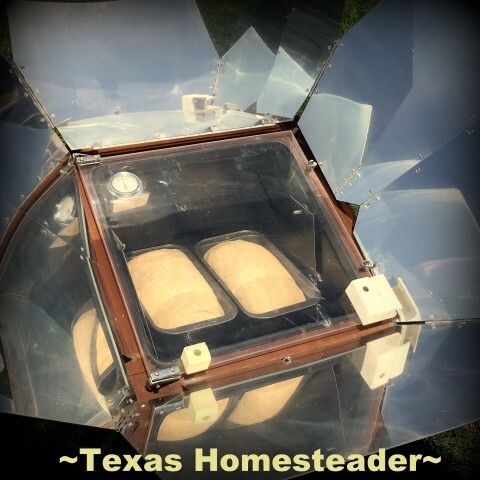 Hey Tammy , Lots of great response to your solar oven bread making , love the Idea . I didn’t know it would get hot enough to make bread being winter. Me living in Washington State haven’t hardly see the sun here this winter. lol thanks for your wonderful post , I can almost smell it from here …. Wow, I didn’t know they could get that hot on a cold day. And nothing warms you up like a piece of freshly baked bread. YUM! saw you on You’re Gonna Love It. Hello, I found this outdoor oven very interesting. I make bread all winter but when hot weather hits here in Ct.forget it! I used to love to plant my own garden, but I developed an allergy to the sun. I haven’t had a garden in 3 years. However grandkids are older and want one so my husband will give it a try. I’m thinking that I can help with the garden at night. I love this idea!! I’ve never tried a solar oven but would love to. I’m curious … did you buy one or make it? I’m pretty sure that I NEED one! And I love that you were able to make a beautiful loaf of bread when it wasn’t all that warm out. Just proves that it doesn’t have to be a hot day … just a sunny. Thanks, so much for sharing! 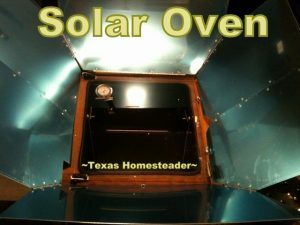 Another great post from TMR 🙂 Very interesting – have never used a solar oven. Thanks for sharing on Home and Garden Thursday. Ha! I never thought of this. How cool to be able to do that. How fabulous is that??!!! Now I want one! Thanks for sharing your outdoor post on The Maple Hill Hop! Good for you! I keep thinking about making a solar oven. Thanks for sharing on The HomeAcre hOp! Very interesting! I’d love to live off the grid someday and this solar oven would be a nice addition! Thanks for sharing with us at Eco-Kids Tuesday. Hope you link up again today! What a cool looking solar oven! I have done solar cooking but always with our own homemade solar cookers! This is such a treat to read about this and your bread turned out amazing! By the way I loved your sky picture! Just gorgeous! Thanks so much for linking up to “The Ole’ Saturday Homesteading Trading Post” blog hop! Hope you join us again next week! How neat! Makes me want to experiment in making this part of our homesteading life. Thanks so much for posting on this. I wonder though if during the summer months, when it is so hot, if it will take less time to bake the bread? Does it make a difference. I also like the idea of solar dehydrating, actually just purchased a book from Amazon.com on solar dehydrating. Currently, we have an Excalibur dehydrator, it surely can put out some heat while in use during the summer.